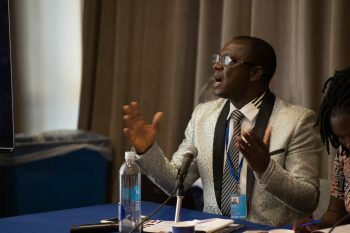 Gravesande’s story, which shared the experience of the Zimbabwean Council of Churches, was one concrete example of the importance of involving religious leaders in addressing harmful gender practices including early marriage, gender based violence and more. ACT Alliance co-hosted the event, along with the Danish Permanent Mission to the UN, DanChurchAid and the UNFPA. The goal of the event, Building Bridges, was to discuss best practices in developing effective partnerships between faith and secular actors to challenge discriminatory gender norms and secure rural women’s rights. A broad range of organisations participated, including Christian Aid, Tearfund, Abaad, Islamic Relief Worldwide, the Joint Learning Initiative, World Vision, and Norwegian Church Aid. Dr. Selina Palm of Stellenbosch University presented research from JLI’s report No more ‘Harmful Traditional Practices’: Working effectively with faith leaders. Palm noted that the term “harmful traditional practices” itself is problematic. “We suggest that it is a term beloved by policy makers, but not very user friendly for practitioners,” she said. The term often makes people defensive, and can put practises into silos isolating them, rather than addressing them in comprehensive programmes like child protection or anti-gender based violence. Faith leaders bring access to spiritual capital, which can be harnessed alongside the health information and knowledge, to transform, over time, opinions and norms in societies. Irene Arena, from ACT member the Church of Uganda, echoed the importance of working with faith leaders. Faith leaders played a key role in ending the war in Uganda. “The faith leaders are actually the sleepy giants, which should be engaged in ending gender-based discriminatory norms and practices.” 90% of the population of Uganda is religious, so DCA and other ACT members engage church leaders as champions of gender justice, building their capacity to respond to gender issues. 2017 was the Year of the Family, and faith leaders were involved in addressing family-based gender discrimination in their communities. Rev. Joseph John Hayab from Nigeria spoke of the need for faiths to come together in addressing gender-based violence. “If we keep thinking it’s about them, not knowing it’s about us, there is no way out,” he said of the realization that in Nigeria, despite the 50/50 Christian/Muslim split in the country, gender issues are found throughout the nation. They are a Christian problem as well as a Muslim problem. Muslims and Christians have become collaborators on gender justice, creating joint resources drawing on Islamic and Biblical sacred texts, and engaging in educating boys and girls in gender issues and positive masculinity/femininity. Dr. Azza Karam, Senior Advisor at the UN Population Fund (UNFPA) spoke of their work with religious leaders as a part of their work for decades. “We have plenty to learn from faith-based actors,” she said, and talked about strategic learning exchanges with faith-based organisations that have helped to build a network of 450 FBOs the UNFPA has worked with since the 1970s. Doing this work with faith leaders is one key way of helping it to happen.